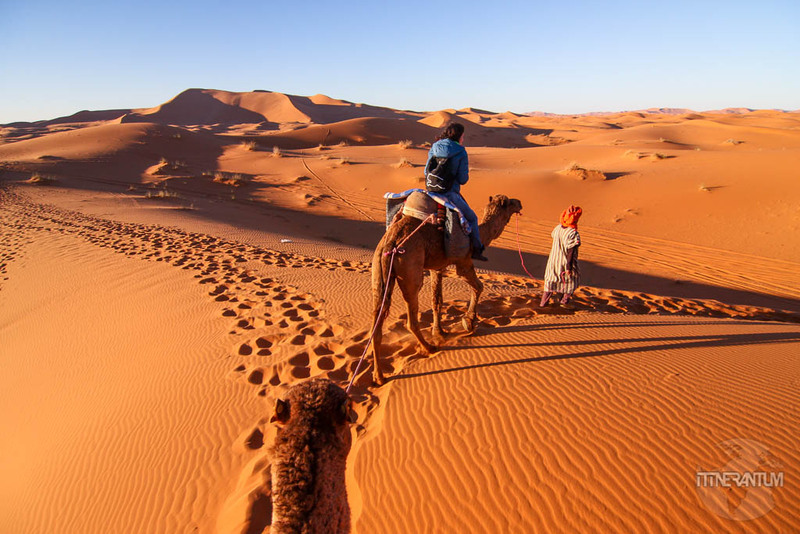 We chose the most popular part, the South, maybe because we wanted to include a new experience for us: the Saharan desert. That meant we had to divide our trip into two separate sections. 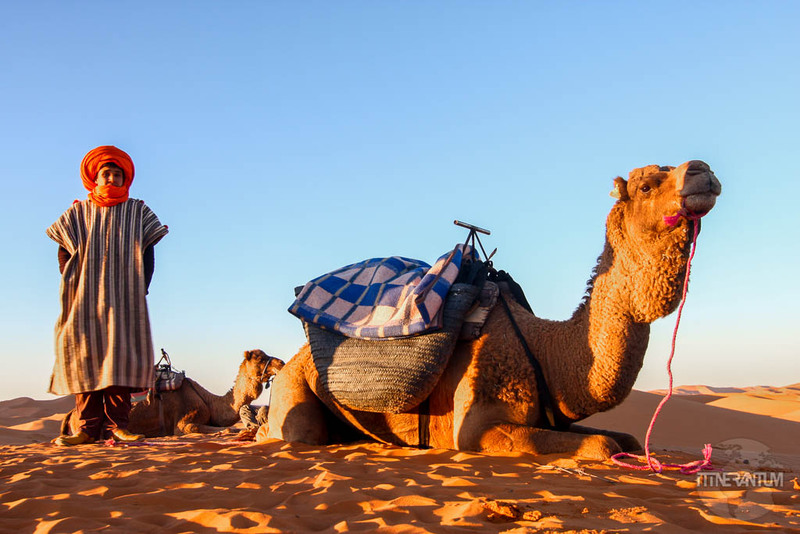 One that we could easily do ourselves with the help of a rented car, and the desert part, that can be more enjoyable and stress-free if we embarked on a desert trip with one of the tour companies. Marrakesh was the obvious choice for landing, considering we did the South part. 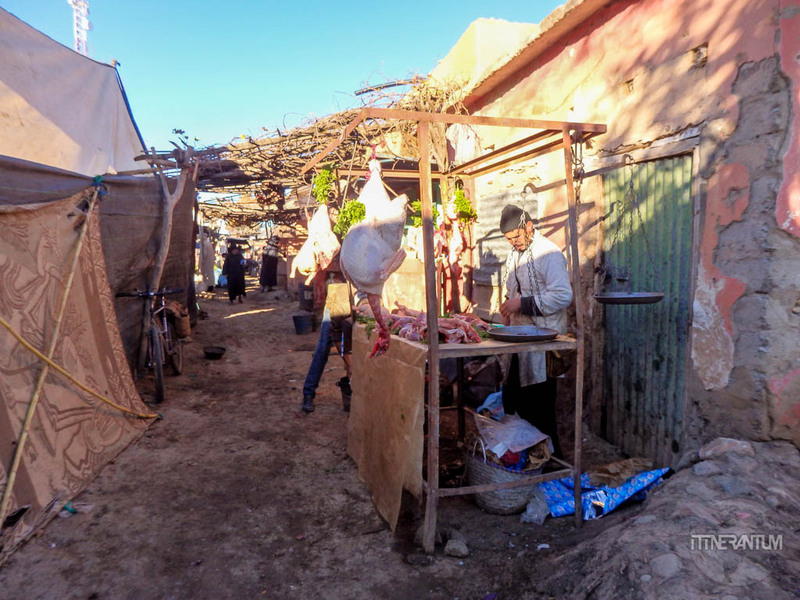 We decided it would be easier to pick up the car straight from the airport and drive to our first destination, Essaouira. It is only a 3-hour drive, a bit less than 200 km, and since we landed in the morning, it made sense not to waste any time and hit the road. 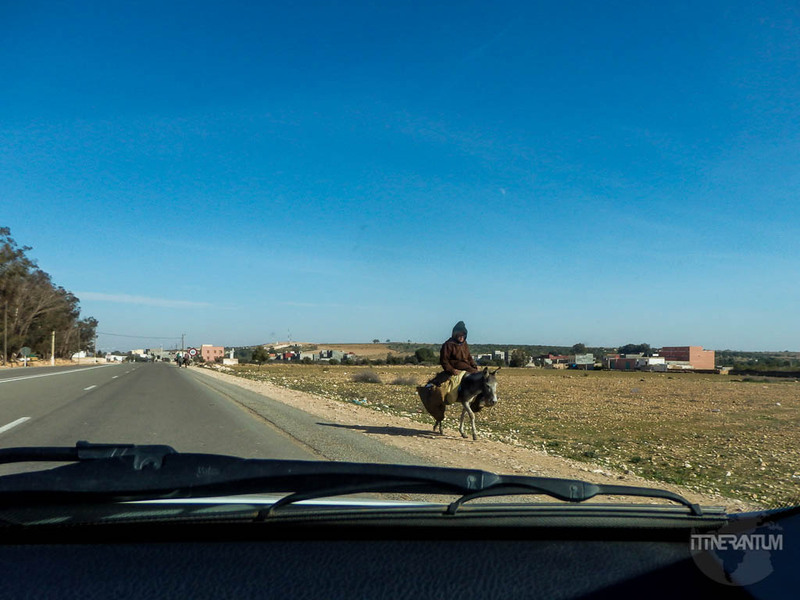 So we picked up our quite new Dacia Logan and quickly found our way out of the airport towards Essaouira. It’s pretty hard to get lost once you’re out of the city, and having a GPS makes things even easier. 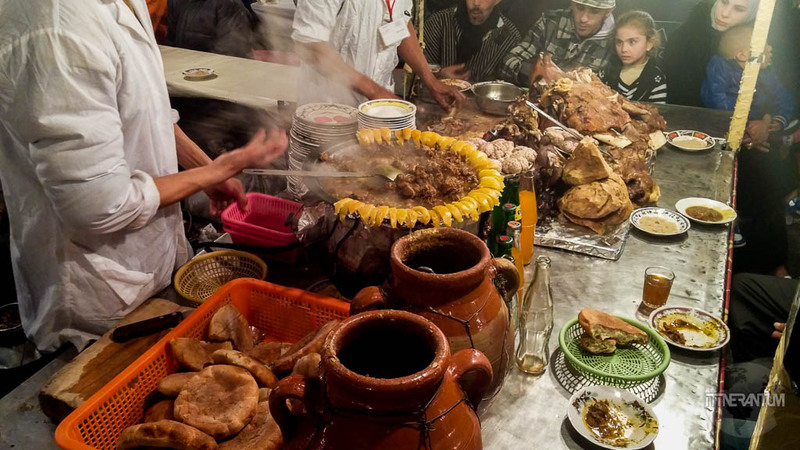 Once on the road and being almost lunch time, I quickly remembered that one of the main reasons for traveling to Morocco was the food. So I became quite excited about trying some of the local delicacies. And it didn’t take long for the opportunity to present itself. 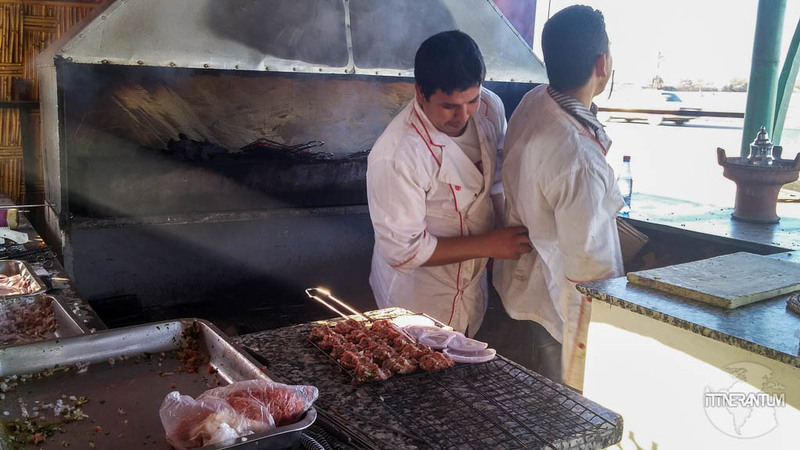 On the side of the road suddenly started to appear a few food stalls with burning grills. Exactly what I needed. Now comes the interesting part, how should I order? Nobody spoke any English and my french is kinda rusty. 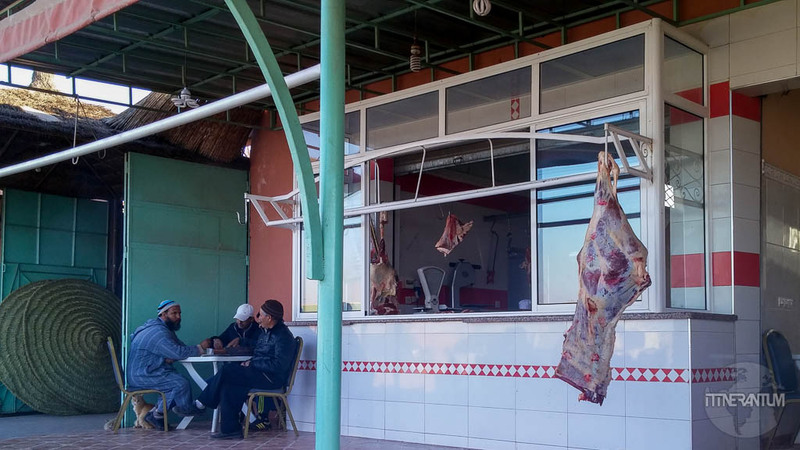 When I told the guy at the grill that I wanted some of the meatballs he was preparing, he pointed to a window that was selling meat. I could see the lamb carcasses hanging in front of it. I insisted, showing him I only want some meatballs and not some steak. The answer was the same. I still had to go to that window. I complied and the butcher managed to explain to me that in order to get the meatballs, I will have to buy a piece of meat. He will then grind it and take it to the grill guy, who will mix it with chopped onions, spices and chili and grill it for me. 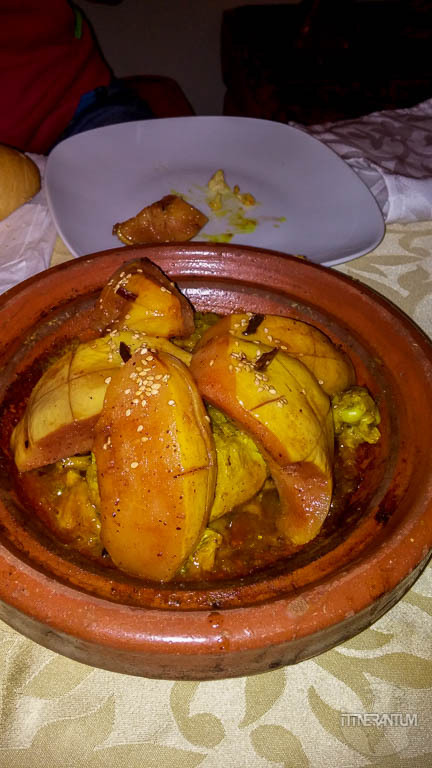 They served it with a salad and I was very happy to have tasted the very first Moroccan spices. They were really good. 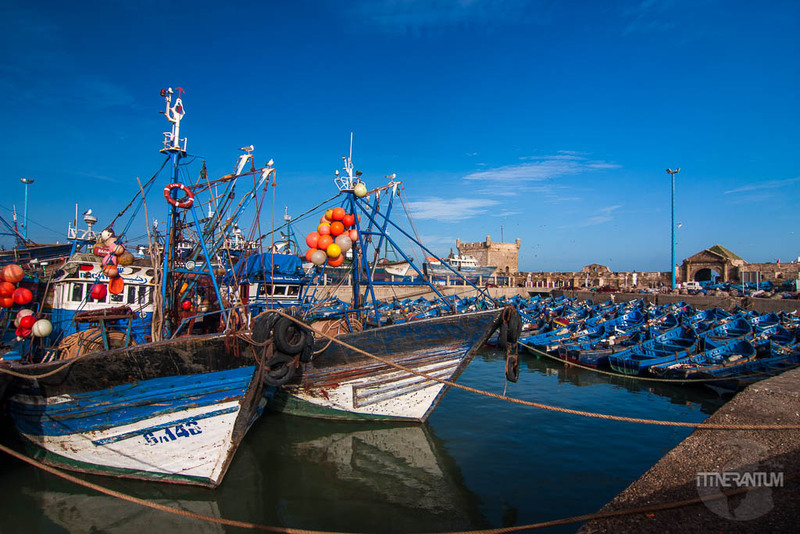 Once we parked the car in one of the guarded car parks the GPS suggested, down at the harbor, we proceeded to Riad Malaika, our lovely accommodation for the night in Essaouira. 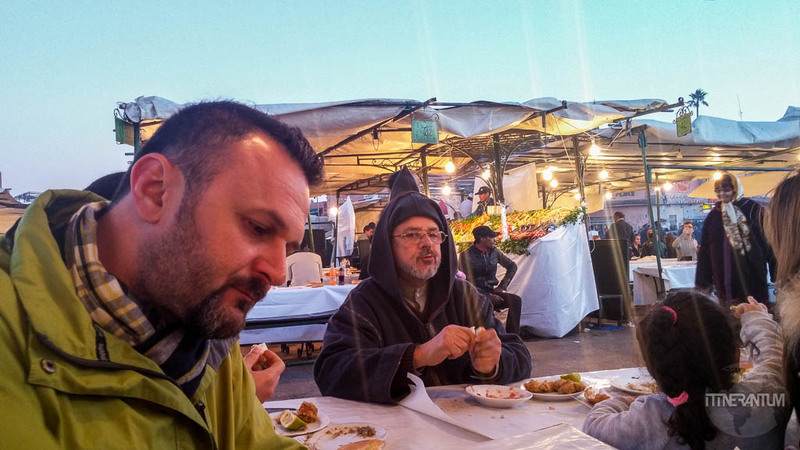 The very nice hosts suggested some of the city’s main attractions and recommended a few long awaited genuine Moroccan restaurants. 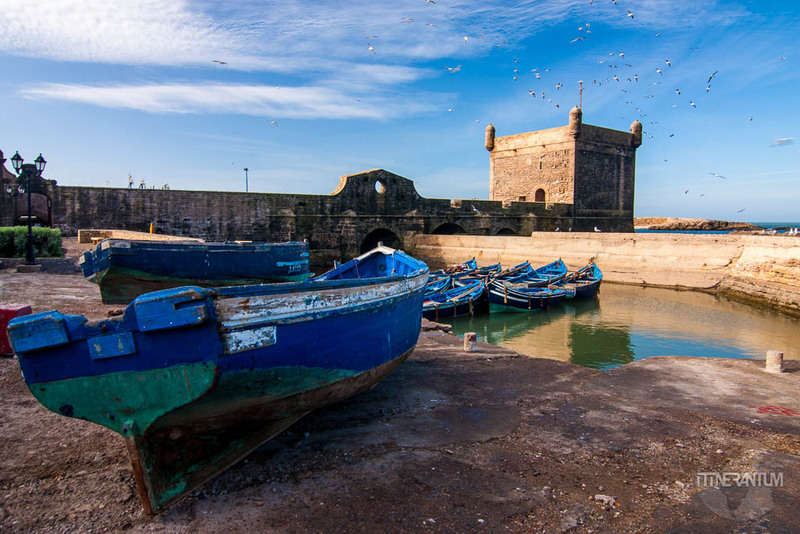 The next day after breakfast, we went down to the very picturesque Essaouira harbor. 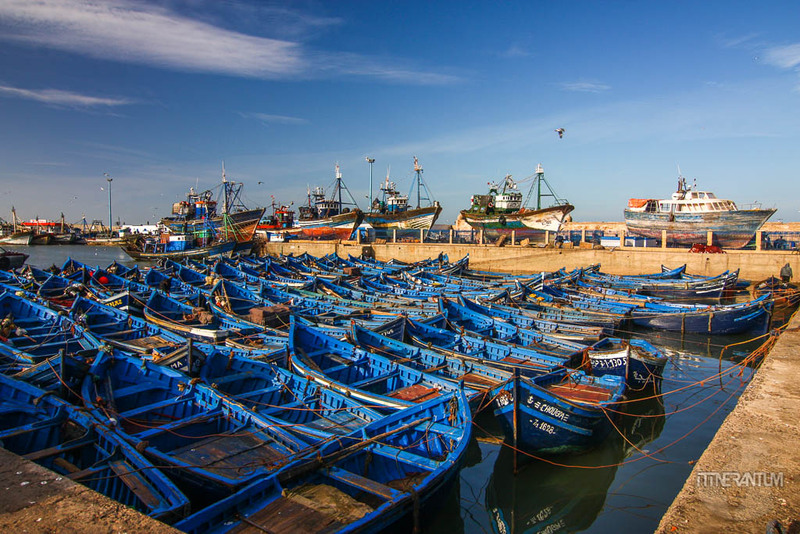 The bustling fishing port with its endless rows of little blue boats offers many amazing photo opportunities. It’s a very nice drive from Essaouira to Imlil with amazing views over the Atlas Mountains, but a bit too long to do it in one day. Therefore, we stopped for the night in Amizmiz just 30 km from Imlil, at L’Oliveraie D’Amizmiz. 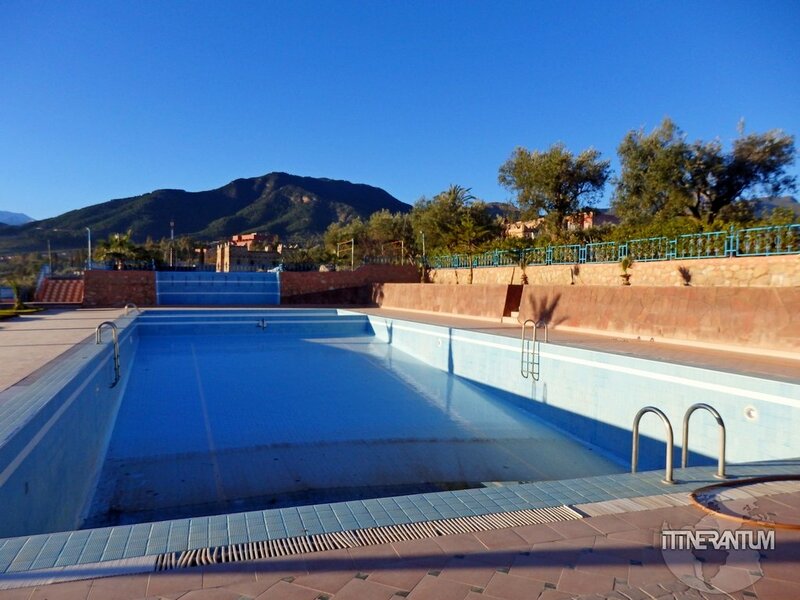 While the guesthouse is not bad, with beautiful surroundings and a nice pool, it was completely empty and we were the only guests. Good thing it was only for one night. 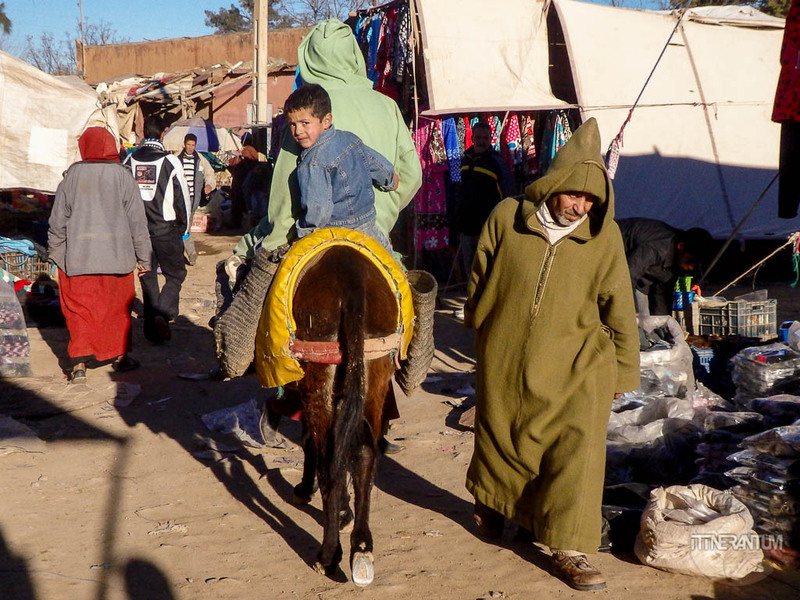 We left for Imlil early morning in order to visit the Tuesday Souk in Amizmiz, one of the biggest Berber markets of the Atlas. 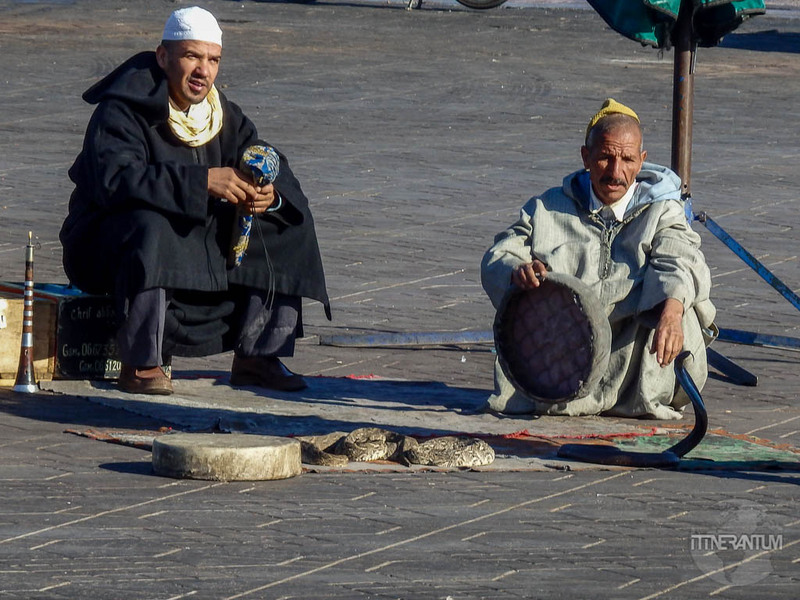 This is not a souk for tourists. We couldn’t see any other foreigners but us. 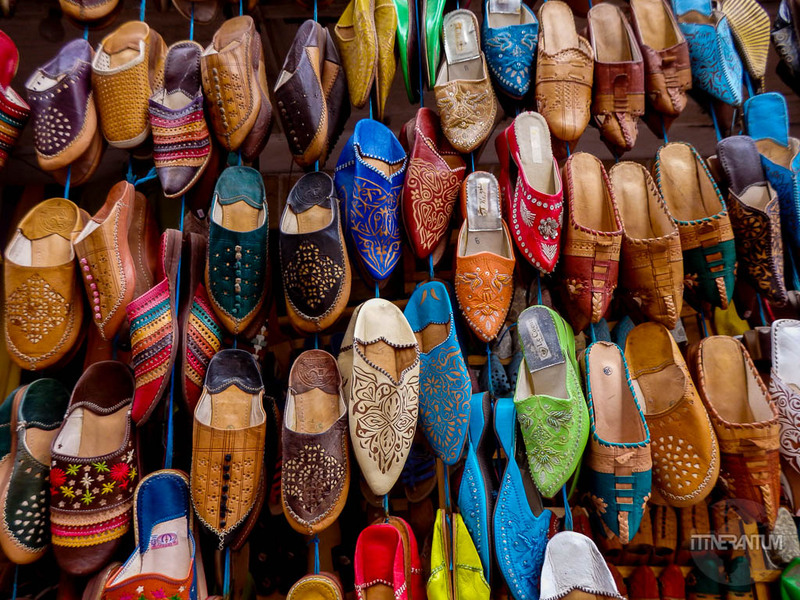 It’s an authentic market, where regular Moroccan buys and sells goods; any goods, from livestock and vegetables to pots, pans and old clothes. We were very glad to be there on a Tuesday. 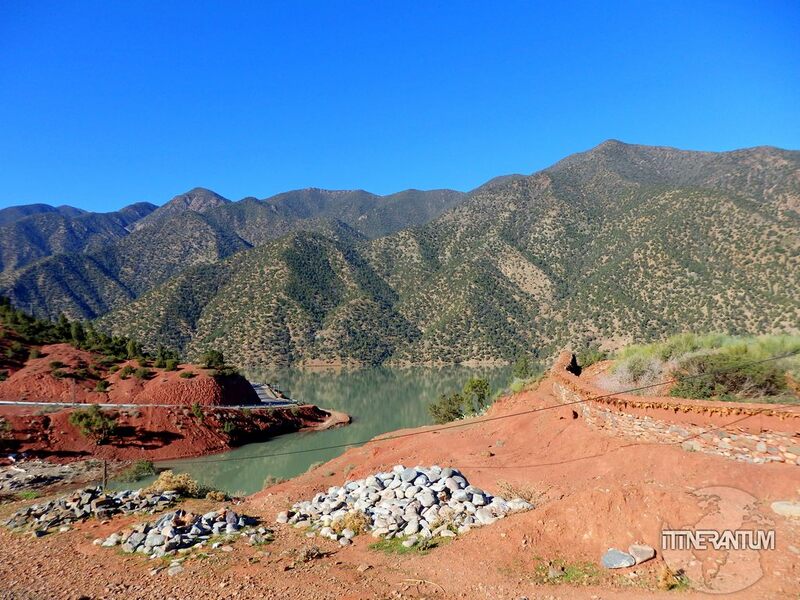 The drive to Imlil takes you past Ouirgane Dam and through some amazing scenery. 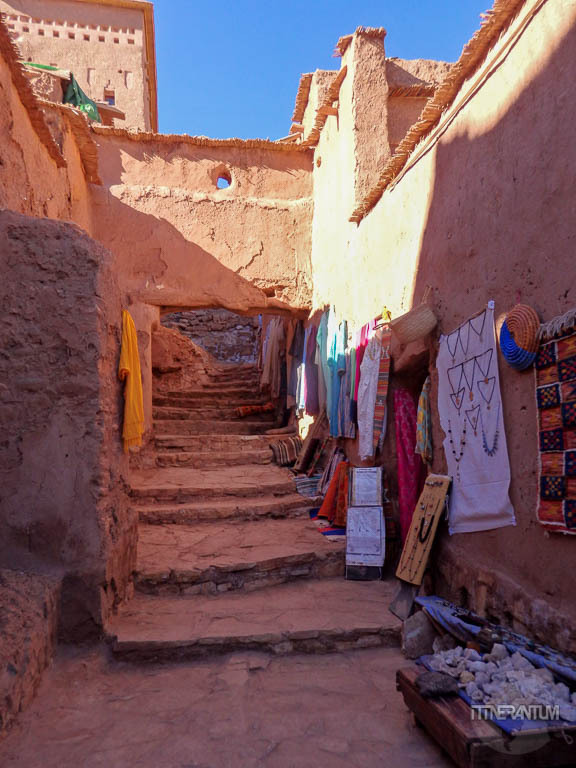 Imlil is a small Berber village nestled at the base of the highest peak in North Africa, Mount Toubkal. 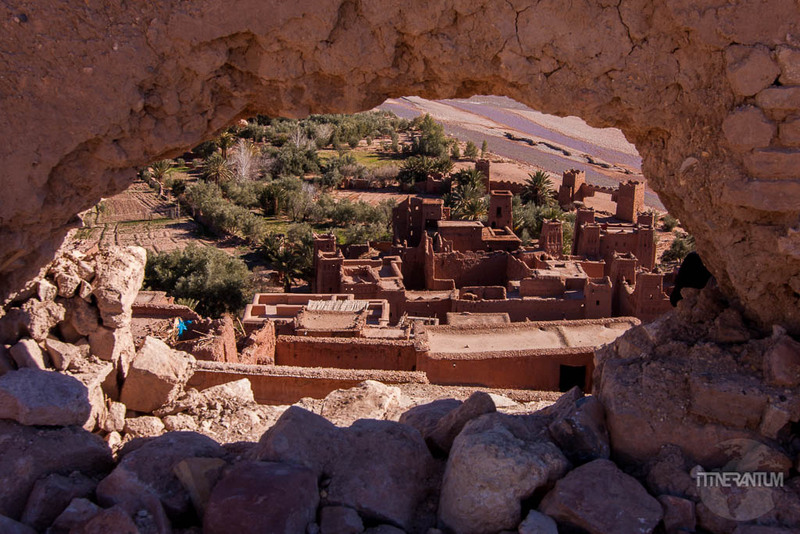 Travelers congregate here to unwind, enjoy the scenery and most importantly, to climb Mount Toubkal. We were not prepared to do any hiking, nor we had the time, so we did a half day trek to one of the villages around Imlil. 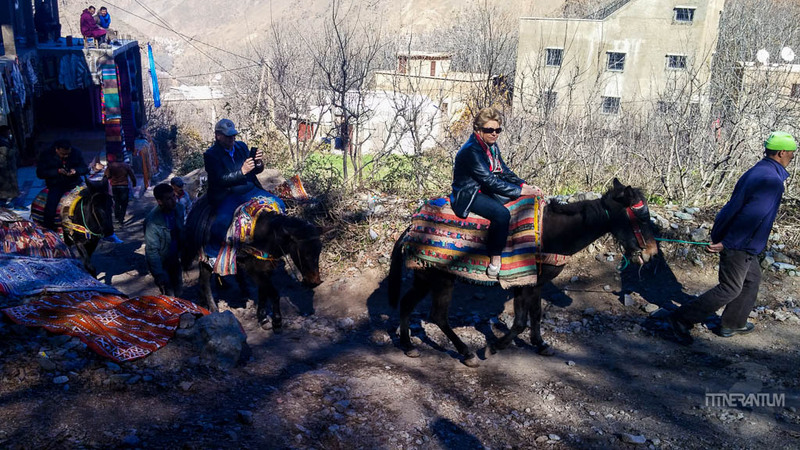 We were offered several times a donkey ride to go up the trails, but we declined politely every time. We’d come there to enjoy nature, not to torture the animals. 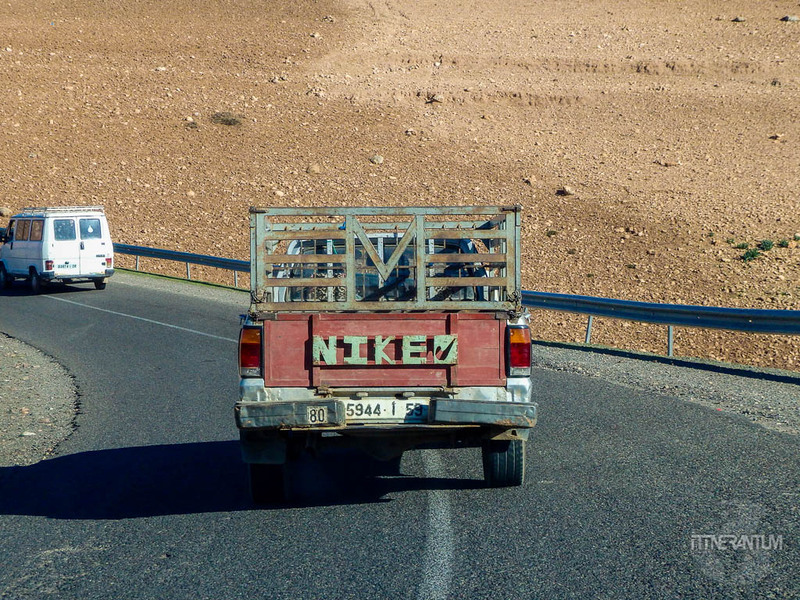 Later in the afternoon, we got to our car and set the GPS to take us to Marrakesh. 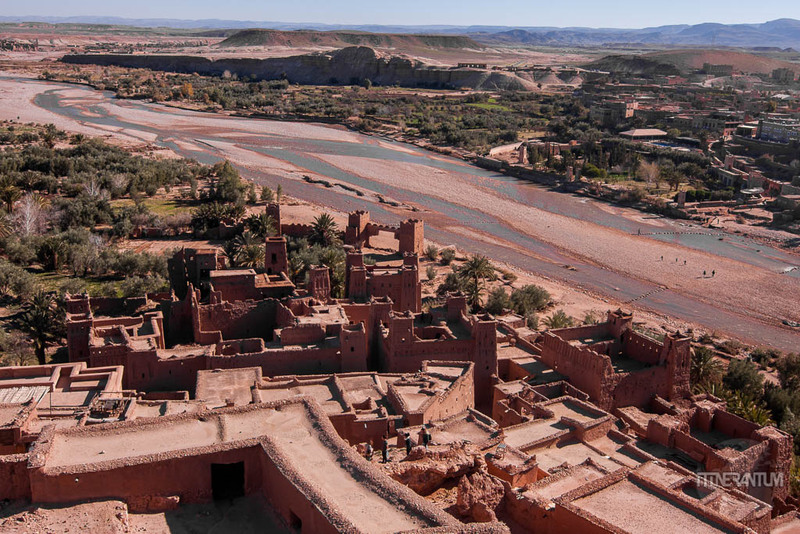 On the way, we passed by the luxurious hotel Kasbah Tamadot. This a true gem, bought by Sir Richard Branson during one of his balloon expeditions. 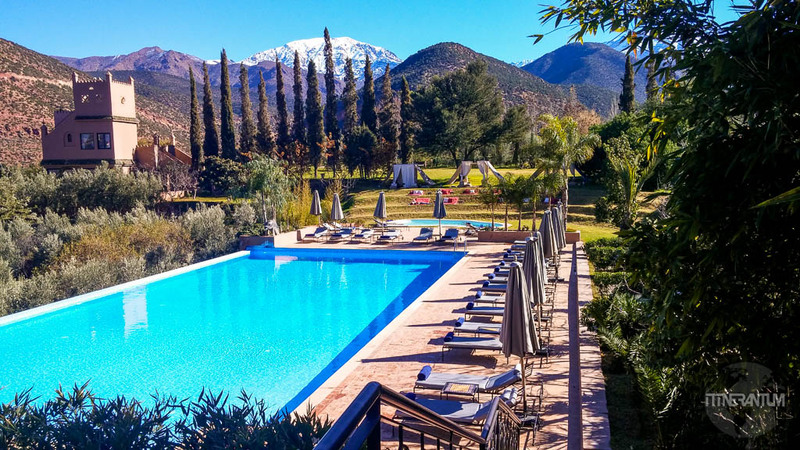 We couldn’t afford to overnight there, but we could definitely afford a mint tea on the terrace overlooking the snowcapped Atlas Mountains. A host came to greet us, and even though we told her that we were only visiting, she insisted we took a tour of the property with no charge or obligation. We were treated like guests and received lots of information about each room and about the history of the place. That is what I call top notch customer service. 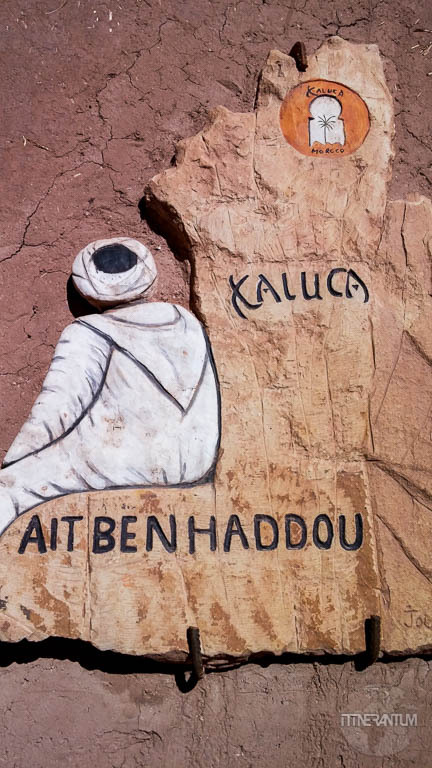 As a side note, Richard Branson nearly crashed with his balloon in the nearby mountains, managing to stabilize the balloon at the very last minute and stay afloat, only to land the next morning in the middle of the Sahara. He bought the place a holiday retreat, the perfect hideaway to invite some of his famous friends. 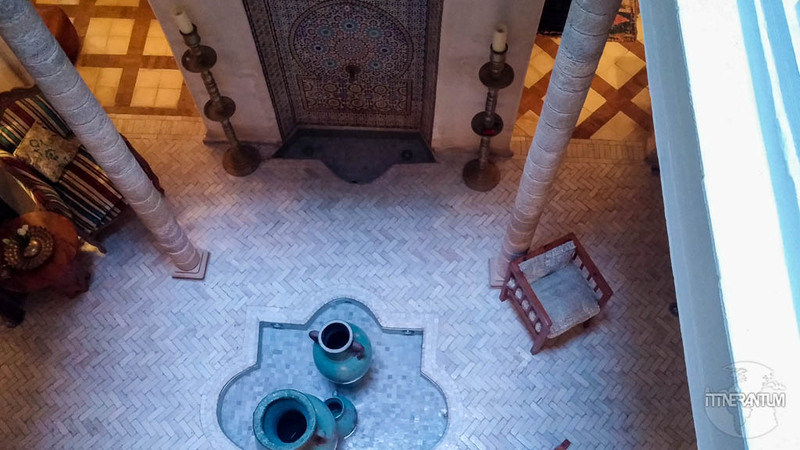 The almost inhabited riad was transformed into the stunning, magical place that the hotel is today. 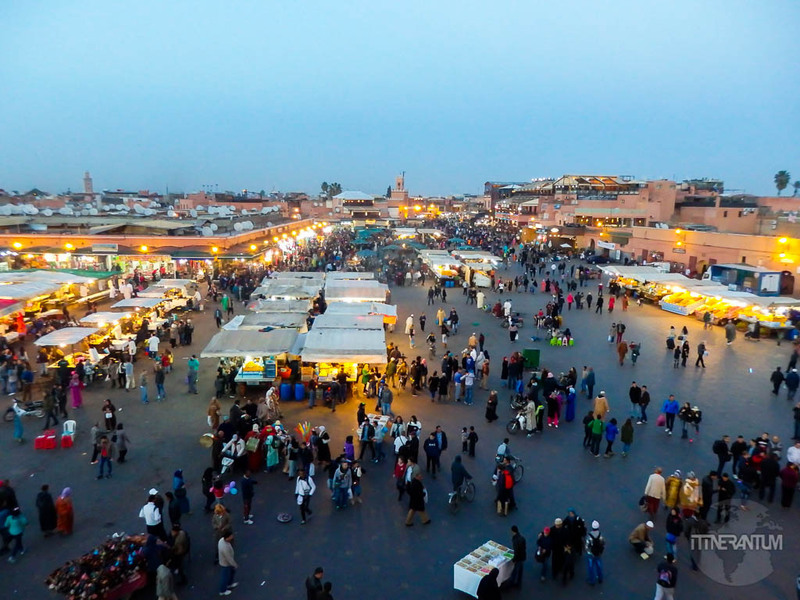 Once inside the medina in Marrakesh, there is absolutely no way you can find your way around, even with the GPS. We were trying to find the closest parking place to our riad, but we found ourselves driving in circles until a guy offered his help (for a fee of course), and we followed his motorbike through the twisted streets until we reached our parking place. 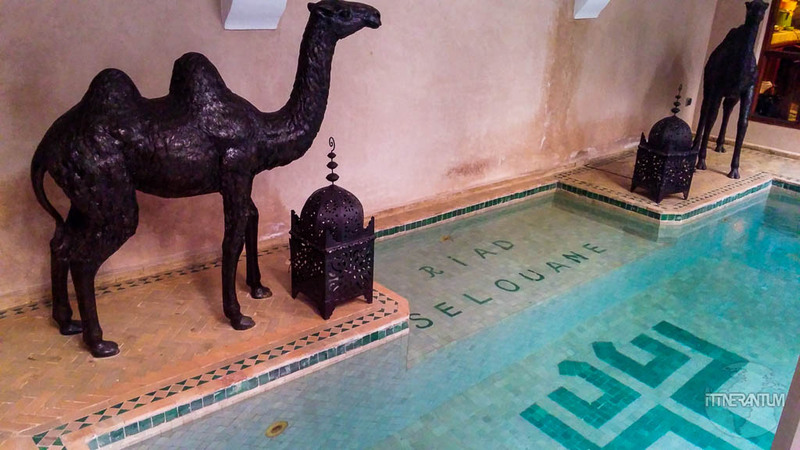 We spent the night at Riad Aubrac, which was a perfect retreat from the hectic medina. The food was great and they even cooked the New Year’s dinner for us. We just had to let them know one day in advance, so they can prepare the meal. 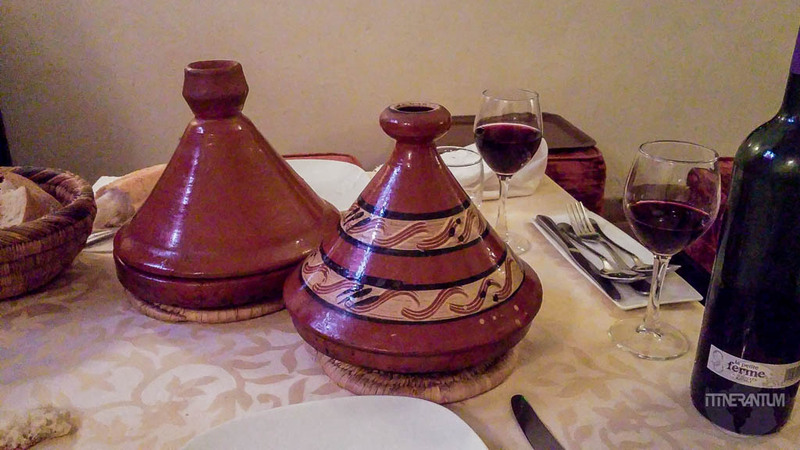 Tagines take a lot of hours to cook. 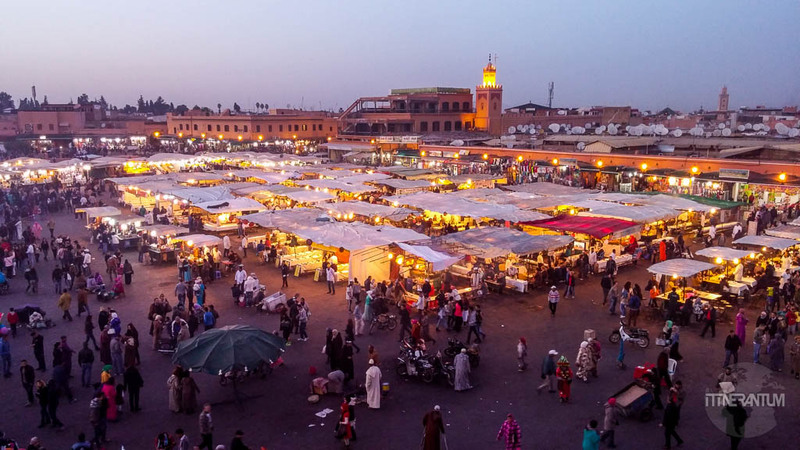 There are so many things you can do in Marrakesh, from getting literarily lost in the maze-like souks to the restless Jemaa el-Fna, the city’s main square. 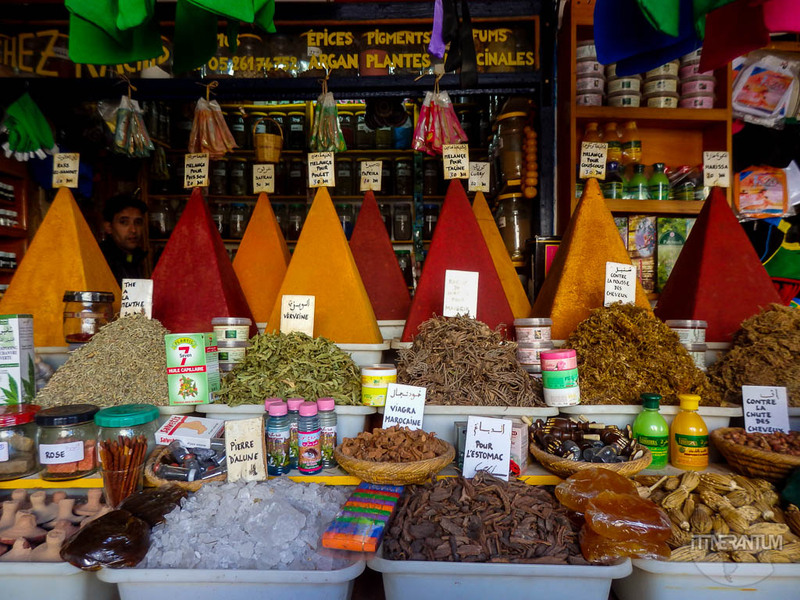 During the day, the place is invaded by orange juice stalls, snake charmers, henna tattooists, touts selling local products and more. At night, however, the square changes into a totally different scene. 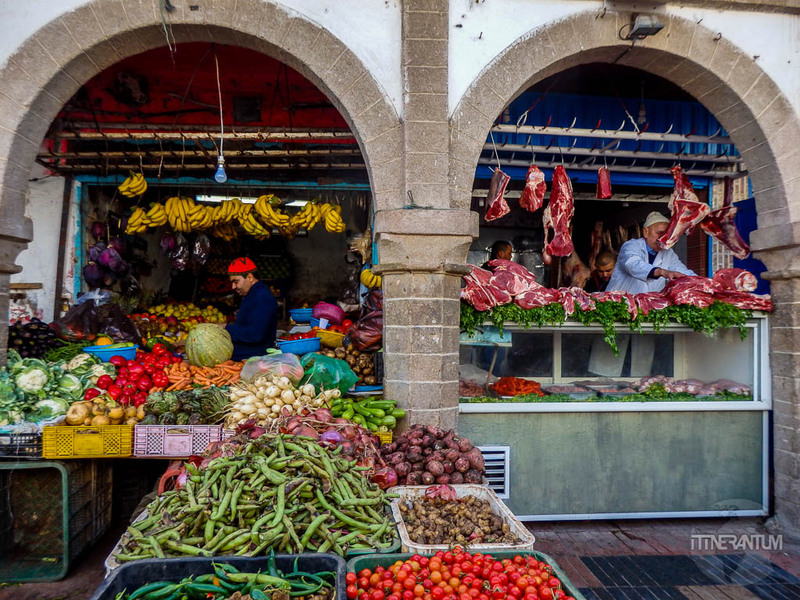 Tens of restaurants emerge in the center the whole variety of local food, from tagines to snail, they have it all. After you’ve had your full, head over to one the big cafes (like Café de France), sit down with a cup of mint tea and enjoy the spectacle. 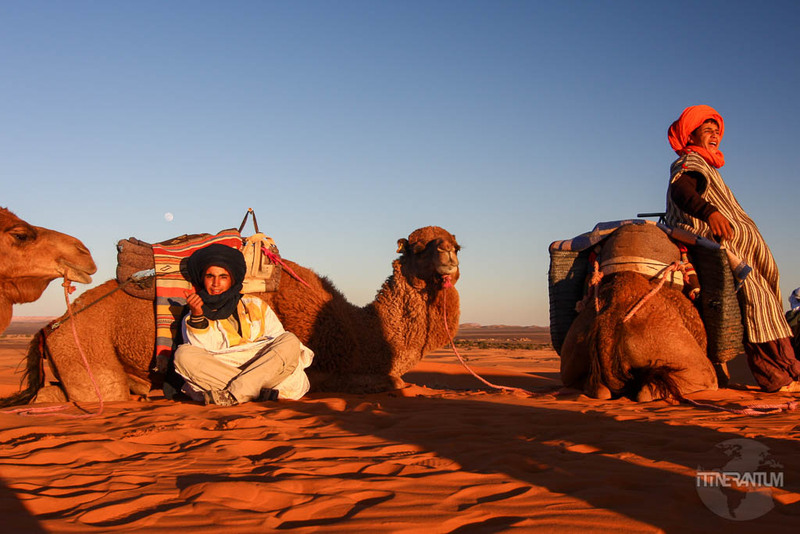 One of the top things on our bucket list this trip was to do a camel trek and go camping in the Sahara desert. 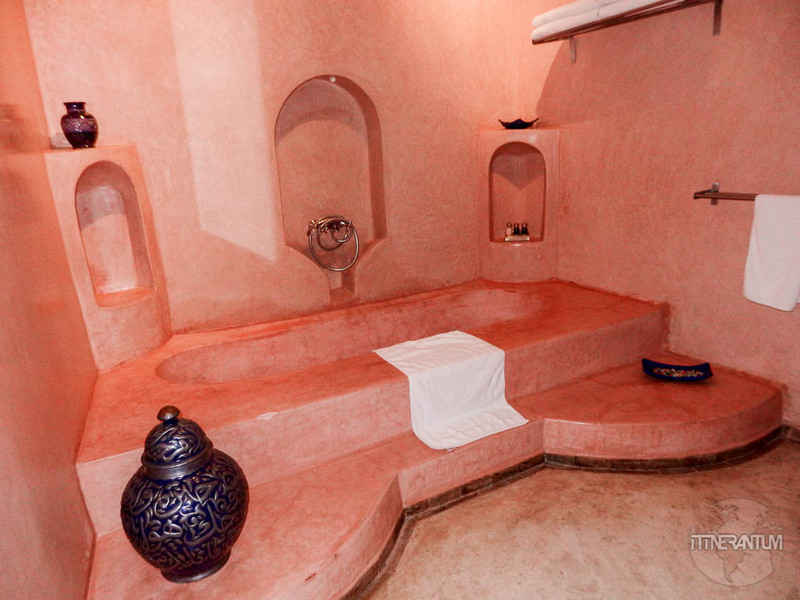 So it was obvious we had to get to Merzouga for that. 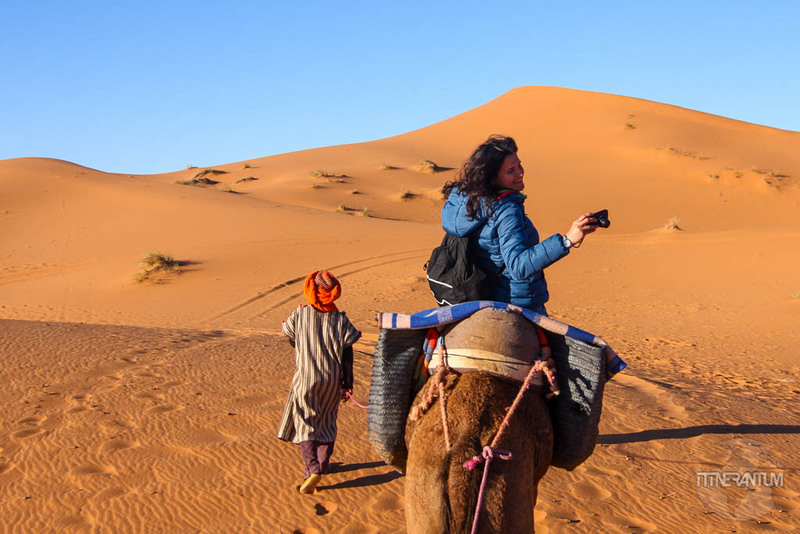 We could have rented a car again and drive to Merzouga, the place where we had to book the camel trek and the overnight in the desert and then drive back. 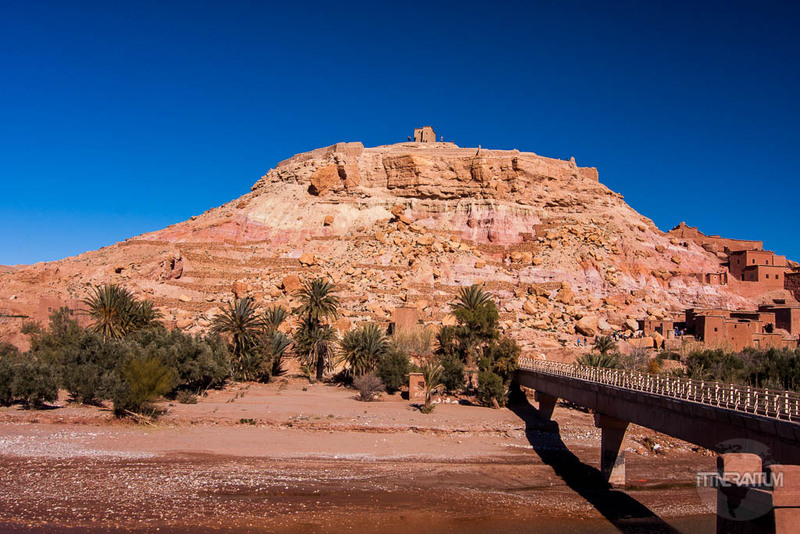 It’s a 10-hour drive from Marrakech to the desert and another 10 hours back, plus we had to pay for the car and the gas, not to mention paying for the actual desert tour once we got to Merzouga. Not exactely relaxing, nor cheap. The choice was easy. 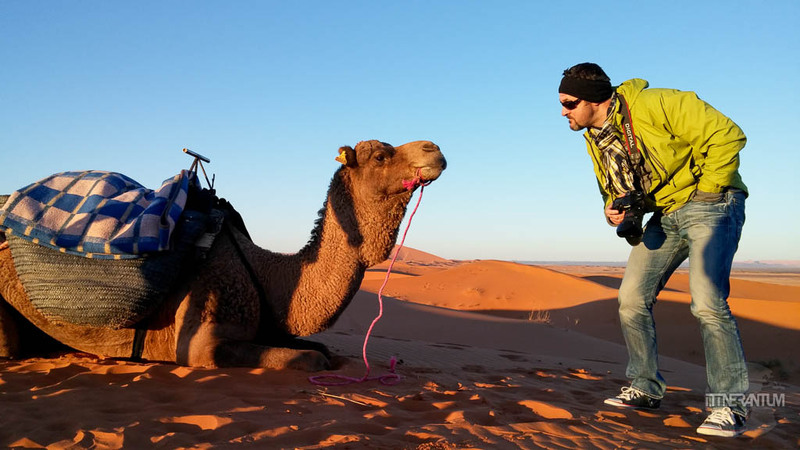 We embarked on a 3-day tour “Authentic Morocco” going to Ait Benhaddou, through the Dades Gorge, then Todra Gorge, Merzouga and Erg Chebbi with Cameltrekking. We paid 150€ p/p and everything was included except for the lunch. Omar, the owner, was great responding to all my emails and helping me with the on-line payment of the deposit. You shouldn’t worry about that as long as it’s a reputable company with good reviews. Most of them require a deposit. The best thing about this company is that they really stick to their promise. 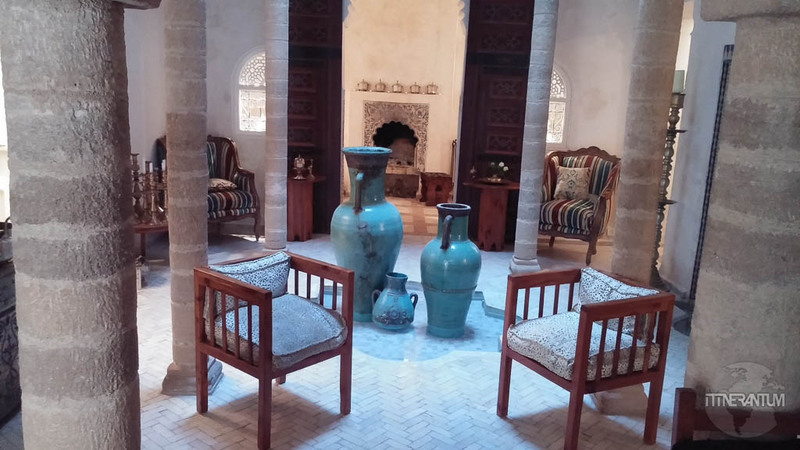 No carpet stores, no souvenir shops, just relax and enjoy the tour. 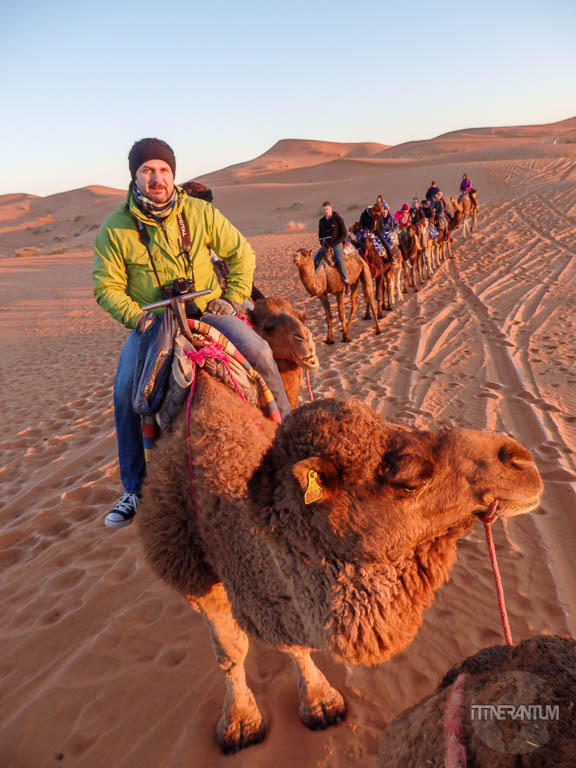 It goes without saying that we highly recommend Cameltrekking. 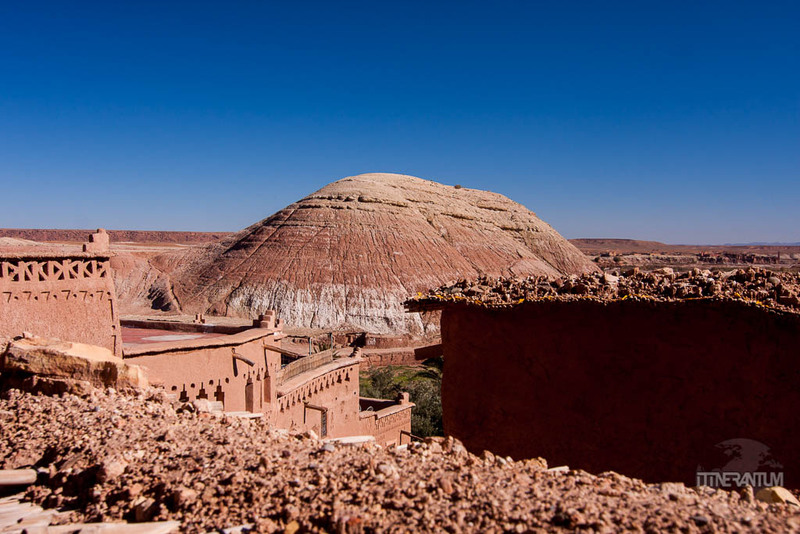 Ait Benhaddou – A World Heritage Site, the famous Kasbah used as a backdrop for many movies including Gladiator, The Mummy, Lawrence of Arabia and the famous Game of Thrones. The place is practically stuck in time. There is nothing modern there, not even a door or a window frame, and that is what makes it so authentic. 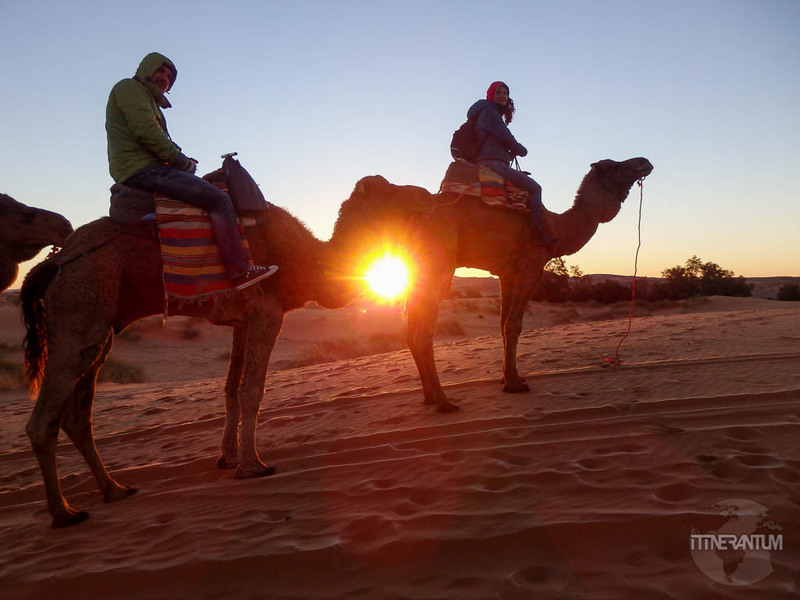 Camel trek and desert camping – The desert experience was surreal and magical. Camel riding is not the most comfortable activity but it was just the right amount not to be in too much pain next day. 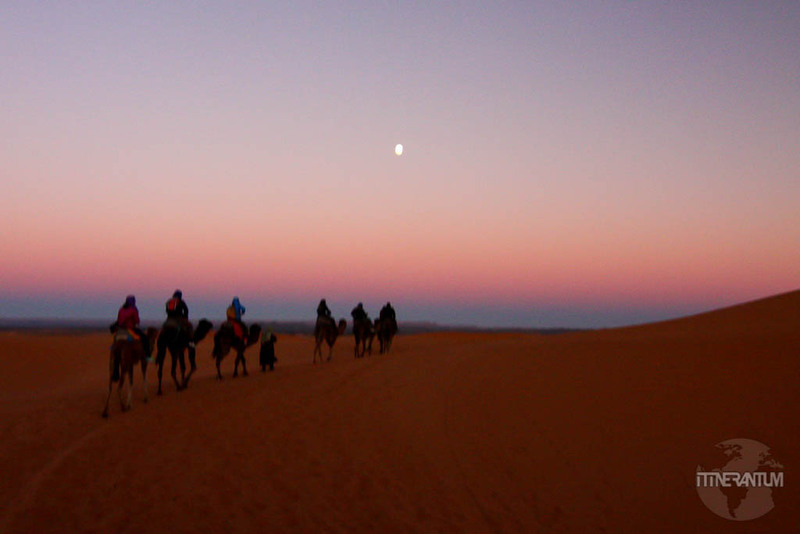 We stopped on top of a dune before reaching the camp to see the sunset. 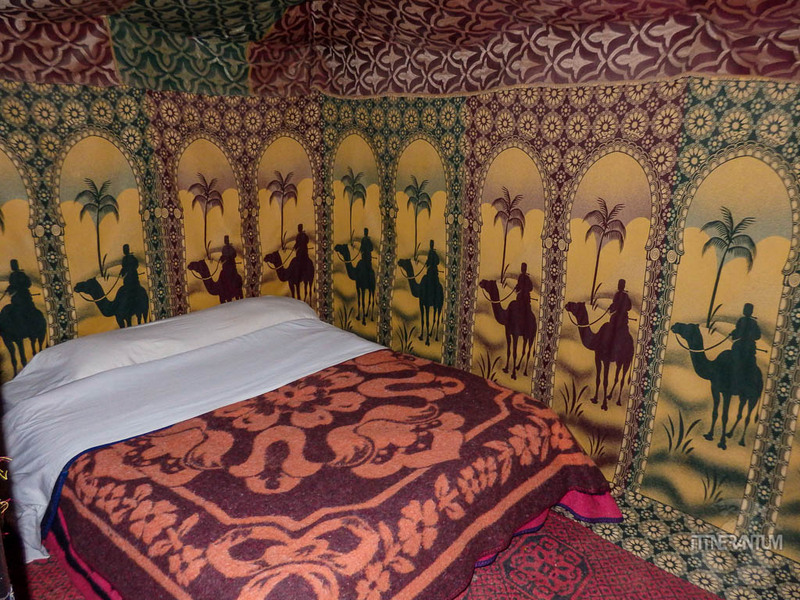 The Berber tents were more pleasant the we imagined. 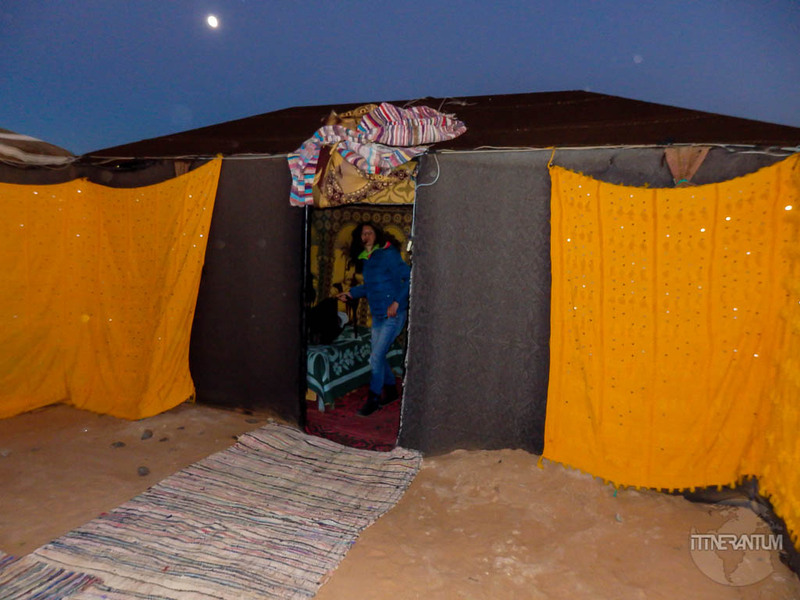 They provided enough blankets so we can cope with the cold of a desert night. 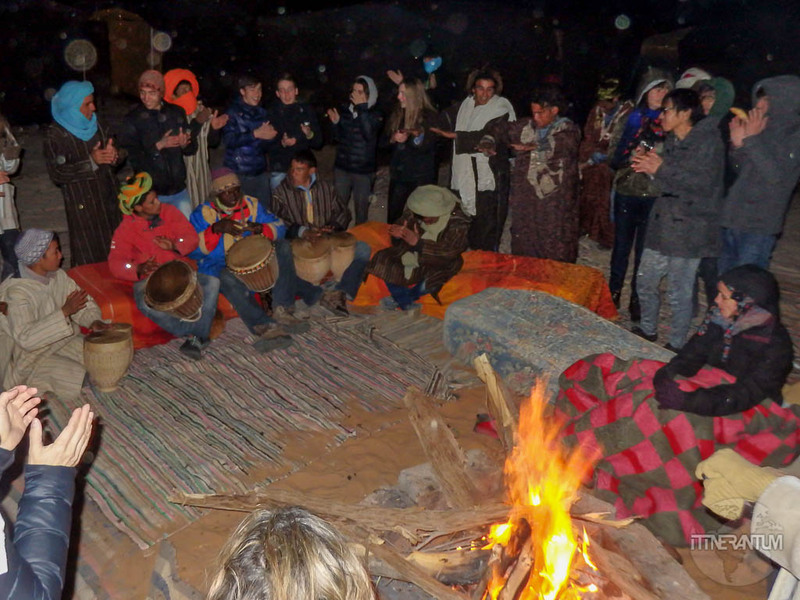 After a great dinner, our hosts kept us entertained throughout the night, drumming and singing around a campfire with a full moon above us. 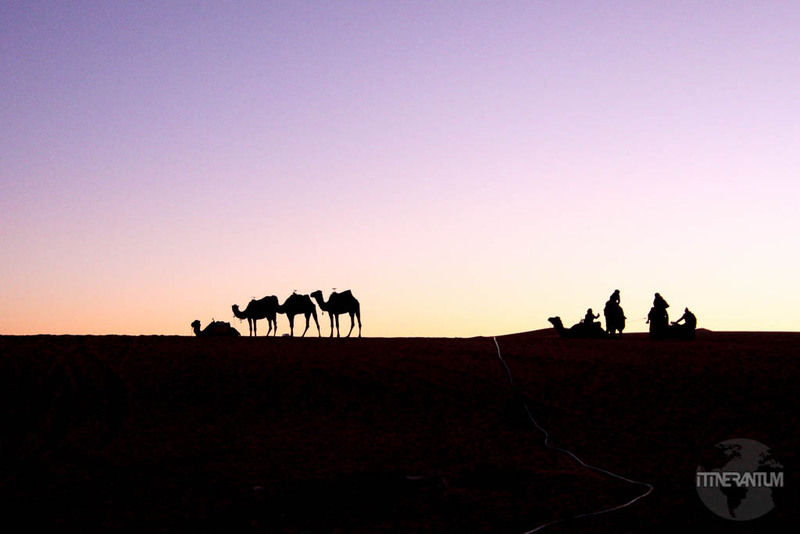 The sunrise next morning found us on the back of the camels. 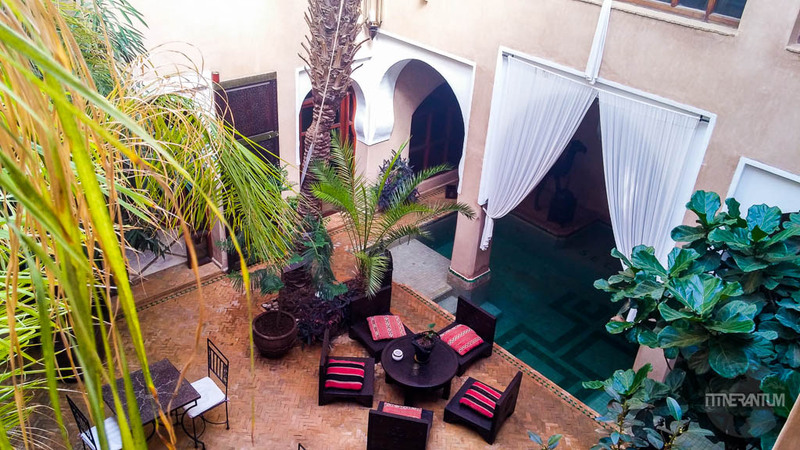 For our second stay in Marrakesh, we stayed at a different riad, also in the medina. 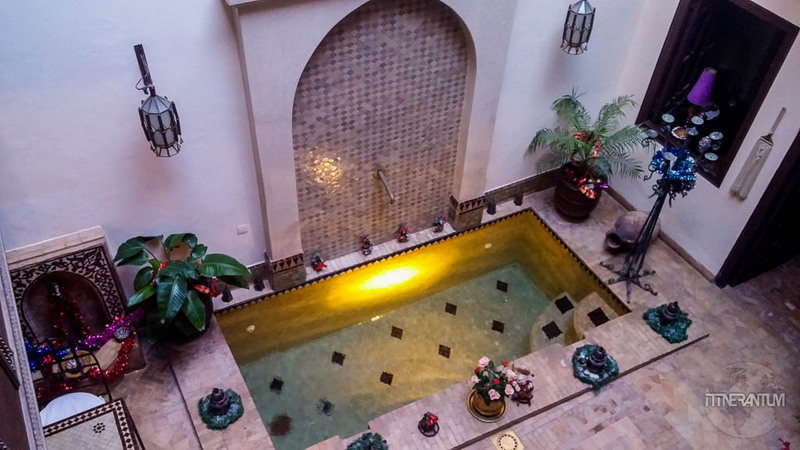 The problems with the riads, is that they are so many, which makes it very difficult to decide. 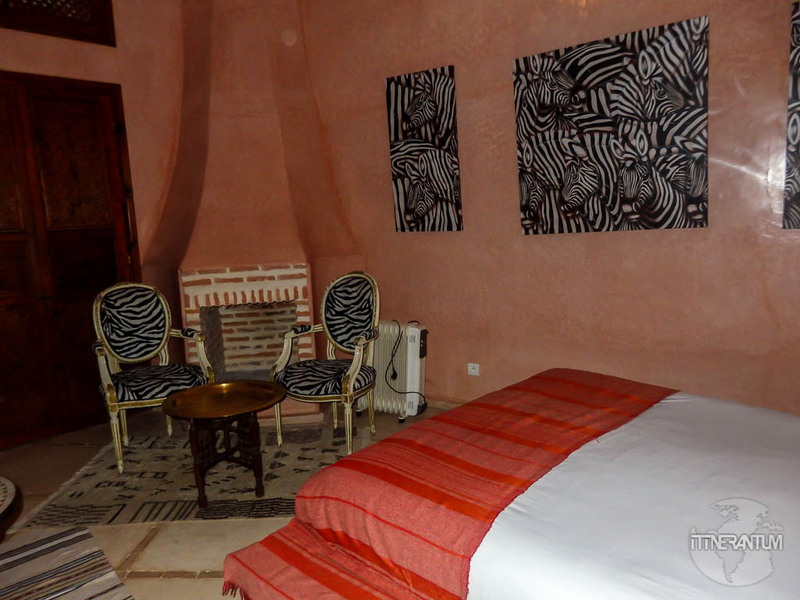 We chose Riad Selouane and it definitely was a much better accommodation that the first one. 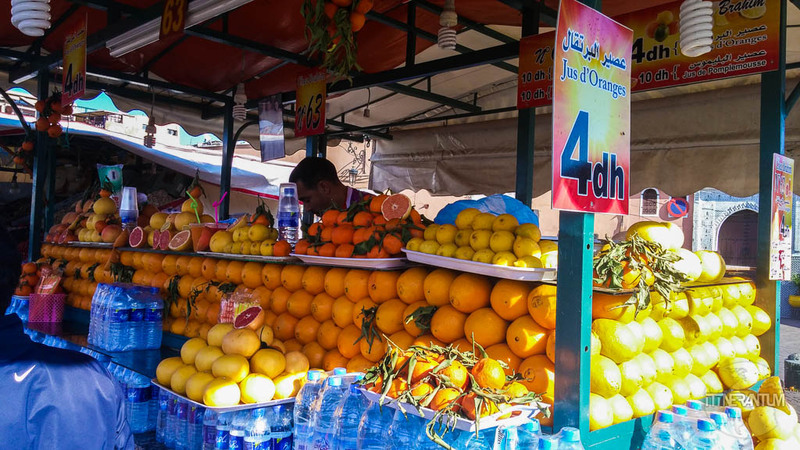 On the last day we had time for another freshly squeezed grapefruit juice in Jeema al Fna square, do some more shopping and pack our bags for our flight the next day. 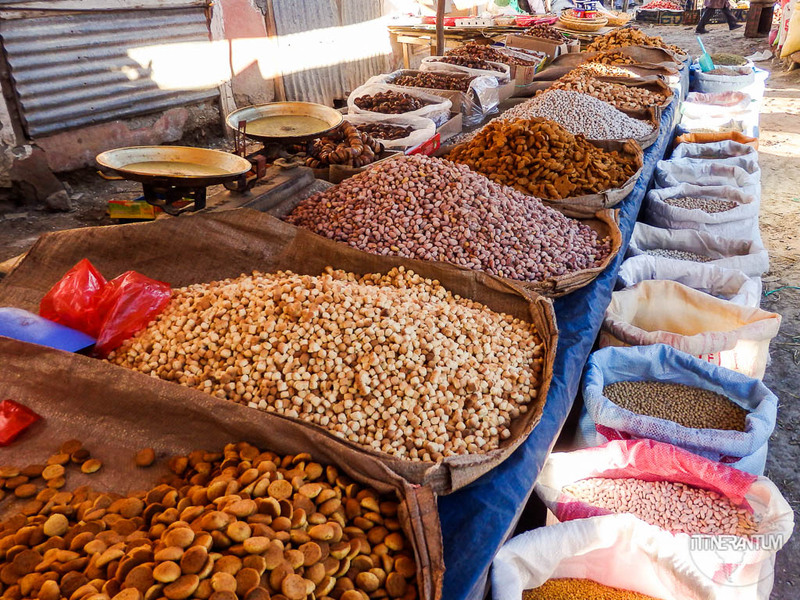 This was our Morocco itinerary. I know 10 days is not a lot of time, but that was all we got and we tried to make the most of it. Most travelers will think it’s the ideal length of stay; others prefer (and afford) to travel slowly. Next time we will probably do a tour of the northern part. 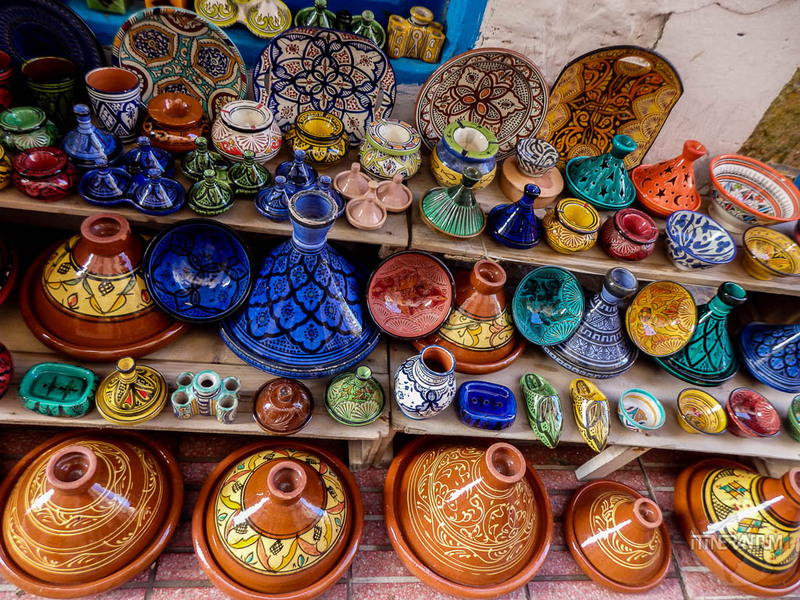 Spend a few days in Fez, capture the beautiful Blue City of Chefchaouen and visit Meknes and Rabat. 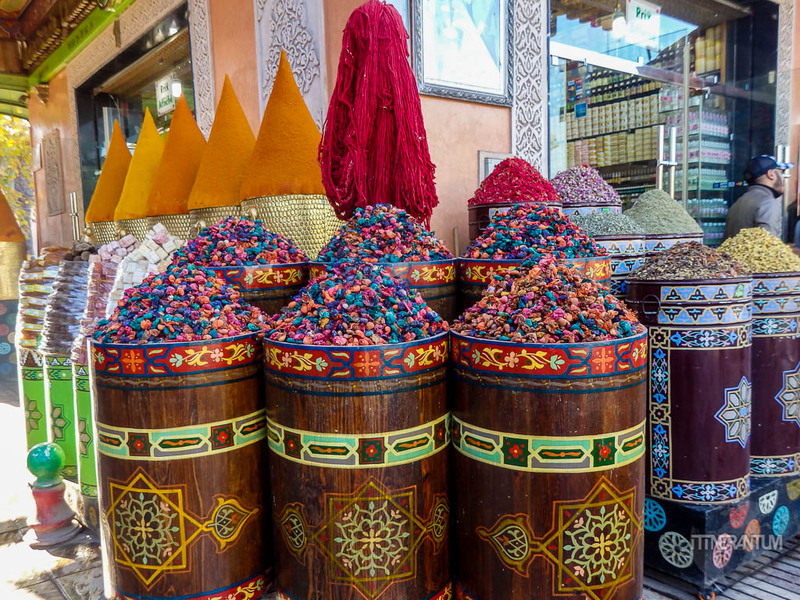 We had a wonderful time in Morocco and I’m sure no matter which part you chose to visit, you will return with great memories. It must’ve been quite an experience to camp at Sahara. It looks so otherworldly!